The primary outcomes were extent of repigmentation, color match, and pattern of repigmentation at 24 weeks. In patients with vitiligo and a short duration of clinical stability (DS) of 3 to 6 months, use of a novel combination of noncultured epidermal cell suspension (NCES) and noncultured dermal cell suspension (NDCS) is associated with an excellent response compared with the use of NCES alone, according to results of a single-center, randomized clinical trial (ClinicalTrials.gov identifier: NCT03013049). This study was conducted in the Department of Dermatology, Venereology, and Leprology, Postgraduate Institute of Medical Education and Research, Chandigarh, India. 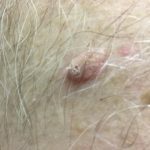 Findings from the study were published in JAMA Dermatology. In this pilot study, the investigators sought to evaluate the efficacy of transplantation of NCES plus NDCS vs NCES alone in patients with vitiligo and DS for 3 months to 6 months or DS for >12 months. Overall, 40 patients with focal, segmental, or generalized vitiligo of 3 to 6 months’ duration or >12 months’ duration were enrolled in the study. According to DS, 2 groups containing 20 patients each were recruited for the study (DS in group 1: 3-6 months; DS in group 2: >12 months). Each of these groups was then further randomly assigned to 2 subgroups, A and B. Patients in subgroups 1A and 2A received NCES alone, whereas patients in subgroups 1B and 2B received NCES plus NDCS. The main study outcomes included the extent of repigmentation, color match, and pattern of repigmentation at 24 weeks. The mean participant age was 24.9±4.0 years; 60% of the patients were women. In group 1 (DS for 3-6 months), >75% repigmentation at 24 weeks was reported among all 10 patients in subgroup 1B (NCES+NDCS) compared with 3 of 10 patients in subgroup 1A (NCES alone; 100% vs 30%, respectively; P =.003), which was statistically significant. In contrast, in group 2 (DS for >12 months), >75% repigmentation at 24 weeks was observed in 6 of 10 patients in subgroup 2A and in 7 of 10 patients in subgroup 2B (NCES; 60% vs 70%; P >.99), which was not statistically significant. The investigators concluded that the use of combined NCES and NDCS is a novel technique that can be used successfully in patients with vitiligo who have a short duration of disease stability (ie, 3-6 months). Future studies with larger sample sizes and longer follow-up periods are warranted to monitor the long-term stability of achieved repigmentation and to further examine the implication of dermal mesenchymal stem cells in individuals with active vitiligo.